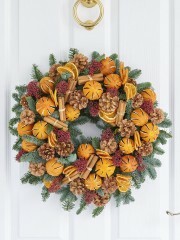 Anyone who has ever experienced organising Christmas will understand just how busy and stressful this occasion can be. From buying gifts to preparing Christmas dinner all the way to arranging evening festivities for family and friends, Christmas can be a bit of daunting time which is where Edinburgh flowers step in with a wonderful selection of Christmas flowers. 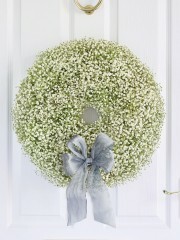 If you’re looking for a unique, slightly more unconventional Christmas gift or decoration, why not try a bouquet of flowers or a Christmas wreath. 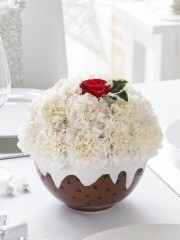 This flower collection is perfect for any and all occasions ranging from birthdays to work related functions all the way to anniversaries and any other imaginable event. 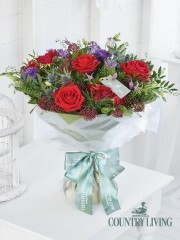 The Edinburgh florists work with only the best flowers which have been cultivated all the way in Holland. Holland is the western region of the Netherlands renowned for cultivating some of the best flowers in the world which means that at Edinburgh flowers, customers receive nothing but the best quality and service. 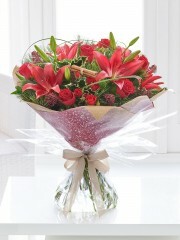 Up on the Edinburgh flowers website you are able to browse through the Christmas flowers range we have to offer. 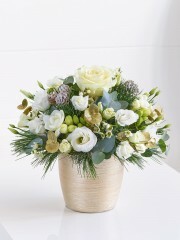 This range includes a variety of different arrangements including festive wreaths, vase arrangements and even floral sleighs as well as lovely hand-tied bouquets and basket arrangements. 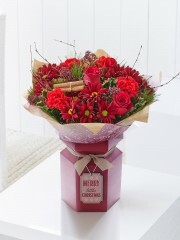 As this is the Christmas flowers range, colour schemes feature predominantly reds and greens. 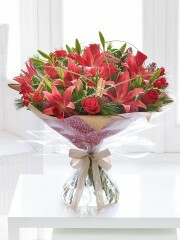 The Edinburgh florists have over forty years of experience when it comes to your orders so you an be rest assured in the knowledge that your flowers are being arranged by capable hands. 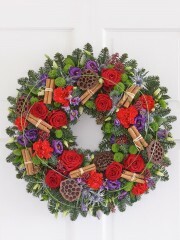 If you have any further queries about the Christmas flowers range or about any of the services provided by Edinburgh flowers, please do not hesitate to get in touch. 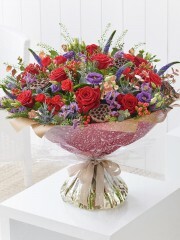 You are able to contact Edinburgh flowers either by phone or via email as there is always a member of the team ready and available to answer any and all of your questions. 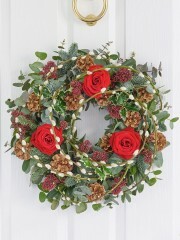 As Christmas is such a busy time, Edinburgh flowers does offer customers several flower delivery services to choose from which will hopefully make it a bit easier for you as it means you don’t have to collect and deliver the flowers yourself. The flower delivery services available at Edinburgh flowers run weekly every Monday to Saturday, between the hours of 9:00AM and 5:30PM. 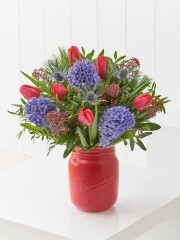 There is the premium next day flower delivery service which allows you to have your flowers delivered the day after your order is placed meaning that everything is taken care of for you within the space of two days. 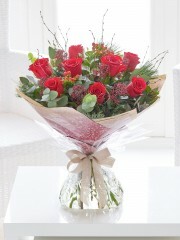 There is also the same day flower delivery service which allows you to have your order delivered on the day it is placed. 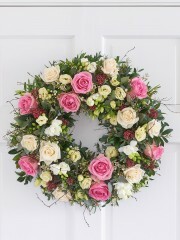 Please not that in order to use this particular flower delivery service your order must be placed before 3PM to give the Edinburgh florists enough time to arrange your flowers to the best possible standard. 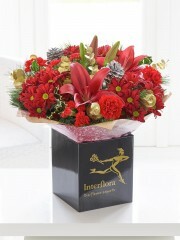 In addition to offering several different flower delivery services, Edinburgh flowers can ensure your orders be delivered to almost any address in the world as we are part of the Interflora delivery network. 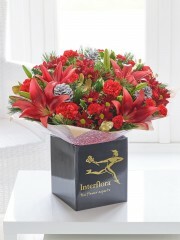 Interflora affiliates Edinburgh flowers with 58000 flower shops worldwide meaning that not only do we deliver locally but we can deliver your flowers nationwide all over the UK as well as abroad to over 140 different countries internationally. 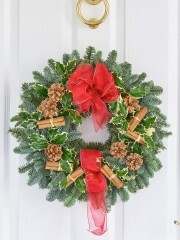 Once your order has been placed at Edinburgh flowers, we’ll take care of everything for you so you are able to focus your efforts and attention on other elements of Christmas.